You should receive an email from The Mizzou Store that includes your personalized link to adopt the materials for your assigned courses. If you don’t receive that link or don’t see all your courses listed, please contact us at umtextadoptions@umsystem.edu. The Mizzou Store is part of the University of Missouri Campus Stores. By sharing services, we have achieved lower prices on course materials and expanded merchandise selection. Most importantly, the Mizzou Store's profits stay at Mizzou to support campus programs and initiatives. Learn more about how The Mizzou Store is providing cheaper alternatives for our students. Open Educational Resources (OER) are teaching and learning materials that are freely available online for everyone to use, whether you are an instructor, student or self-learner. Examples of OER include: full courses, course modules, syllabi, lectures, homework assignments, quizzes, lab and classroom activities, pedagogical materials, games, simulations, and many more resources contained in digital media collections from around the world. Learn more about Open Educational Resources. If you want to provide your students options, you can work with Mizzou Publishing to offer these materials as Print on Demand. Do you use readings from several sources in order to fully teach a subject? Do you use only selected chapters out of books? Do you use PowerPoint slides or study sheets? What about homework assignments? Add your syllabus and lecture notes to make it fully functional. 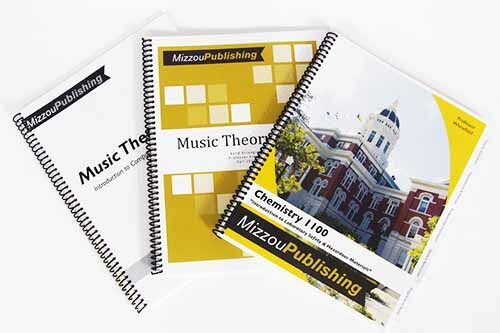 With Mizzou Publishing, you can compile your own course book(s) to fit YOUR teaching style. Mizzou Publishing will work with you to create your custom course reader/packet and ensure that it is copyright compliant. Whether it is an Out of Print book, old exams or a selection of readings from journals/books/online sources – Mizzou Publishing can assist you in creating a custom book that suits your teaching style and meets the needs of your students. Learn more about Mizzou Publishing Custom Course Packets or contact Heather Tearney at mizzoupublishing@missouri.edu for more information. In 2014, we launched AutoAccess, a partnership with The Mizzou Store, publishers and faculty that provides course content via the campus learning management system (LMS) at a reduced cost. We work with over 12 different publishers (McGraw Hill, Pearson, Cengage, ect.). Students enrolled in this program have saved over $10 million compared to new prices since 2014. Does your class require specialized course material items or custom kits such as Art kits, Drafting kits, Rock kits, Geology kits, Robotics kits, Architecture model building material or something else? We can create custom kits to meet your needs! Contact us at umtextadoptions@umsystem.edu and let us know what you need!